The first farm visit on the Georgia Peanut Tour was Joe Boddiford’s Farms. The farm is operated by Joe and his son Knapp. Joe, a third-generation farmer, has been farming for over 45 years and serves on the Georgia Peanut Commission Board. 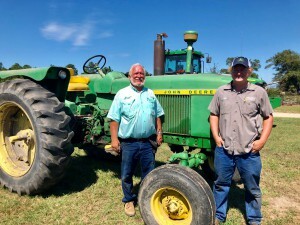 During this farm stop, Joe showed tour attendees an array of tractors used on their farm including an old 1965 3010 John Deere which Joe has actually owned twice. The tractor was bought new by Joe’s father and was what Joe start farming with until he decided to sell it in the 90s. Ten years or so later, Joe was at a tractor sale in South Carolina and said, “That’s my tractor!” Of course, Joe paid more for it than what he sold it for, but it was well worth it. 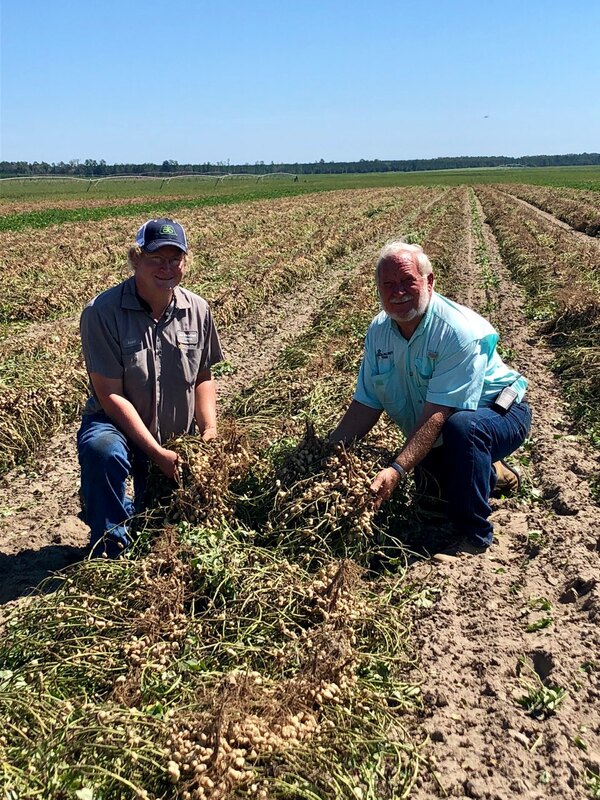 Joe’s son, Knapp, is a recent graduate of the Abraham Baldwin Agricultural College located in Tifton, Ga. After receiving a degree in diversified agricultural with a concentration in agricultural business, Knapp returned to the family farm where he knew he would always end up. Knapp decided to attend ABAC after graduation instead of just going straight into farming because he wanted to learn more about the business side of agriculture and once at ABAC, he fell in love with the college and the people and knew the knowledge and connections would help him advance on and off his farming operation. Knapp says returning to the farm has been a challenging but rewarding experience, but couldn’t see himself anywhere else. Knapp’s favorite thing about working with his dad is being able to learn from his years of experience but also getting to teach him something new every now and then. One of the most valuable lessons Joe has taught Knapp is the value of a hard day’s work because the whole act of farming is to complete the task on time and to do it well to make a crop. Knapp is already showing much success. In 2016, Knapp was awarded as National FFA Star Finalist in Ag Placement. This means he was one of the top four finalist in the nation in this category and anyone that has worked for someone in the agricultural industry could compete in this category. While at the farm, attendees were able to see peanuts being dug and harvested, they also had the opportunity to see corn harvesting. They were even able to see Knapp turn on the irrigation pivots from the touch of button thanks to a mobile app on his phone. Knapp made the comment that he could even turn the pivots on and off while he was in Tifton at college. Kendall Kirk, a precision agricultural engineer with Clemson University made an appearance at this field stop and talked about the research Clemson University is doing and on Joe Boddiford Farms. Kirk and Clemson University has been working with the Boddiford’s for roughly the past five years. He talked to attendees about attendees about the different technology on the tractor. The main focus Kirk wanted attendees to look at was the automated depth control system on the peanut digger, which is not available commercially yet, but Clemson is in the process of working with AMADAS on putting the system together. During the visit at Boddiford Farms, tour attendees were able to hear a crop update by Ray Hick, Screven County Extension Agent. “I deal with homeowners in the urban area, lawn problems. I always say it’s the little old gray-haired lady with the rose bush problems and everything up to the major producers of crops here in the area. I may be in town in the morning then on the farm with a row crop producer talking about his cotton crop or his peanut crop in the afternoon, says Hicks.” When it comes to challenges farmers have faced in Screven County Hicks goes on to say, “This year the farmers have had a wide diversity of challenges. Of course, we started off being dry, then we got into a wet period and it delayed some of our plantings, so really, we have two different crops in cotton and peanuts. We have an early crop and a late crop. Now with all the wet weather, it has been trying for the producers to keep fungicides on top of the fungicide sprays, but we have not had to turn the irrigation systems on as much so that will be a saving for them at the end of the year.” Ag South Farm Credit also provided boiled peanuts for participants to enjoy during this stop, and for many, this southern staple was first time experience.